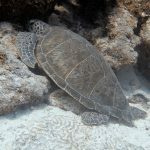 Ever since I certified as a PADI Divemaster I’ve been developing an interest in solo diving. When I say this out loud, quite a few divers immediately will remind me that you’re always supposed to dive with this buddy. Whilst this was the popular opinion for a long time, views are changing on this matter. In fact, there’s a positive development towards educating divers how to dive responsible on their own. One of these ways to become more skilled and knowledge able about diving on your own is the PADI Self Reliant Diver Course. There are several good reasons to go diving on your own after all…. It prevents you from getting teamed up with an unsuitable buddy. You can photograph in a no rushed way, no buddies waiting for you. 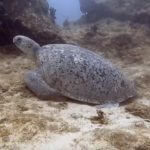 PADI has developed a course called Self Reliant Diver. 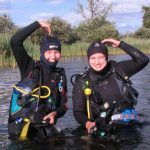 The course is designed for divers that can’t or don’t want to dive with a buddy all the time and/or for divers that just want to become more self reliant in general. The skills and knowledge gained in the course are both useful for solo diving as for diving in a group, it will just make you less depending on others. Both recreational divers as industry professionals can benefit from taking this course. 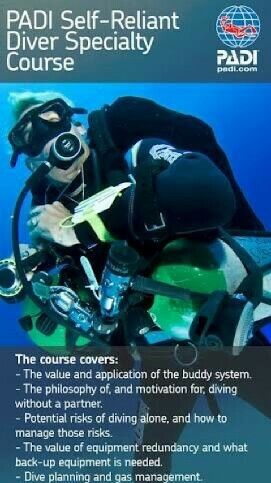 I personally think any instructor or divemaster should know everything there is to be learned from this course. So in my case, it was long overdue! For about a year I knew I wanted to do the Self Reliant course. But given this course is not yet that well known, it’s actually not offered everywhere. Imagine my happiness levels when I learned that Koh Tao, Thailand is one of the places where you can actually do the course! 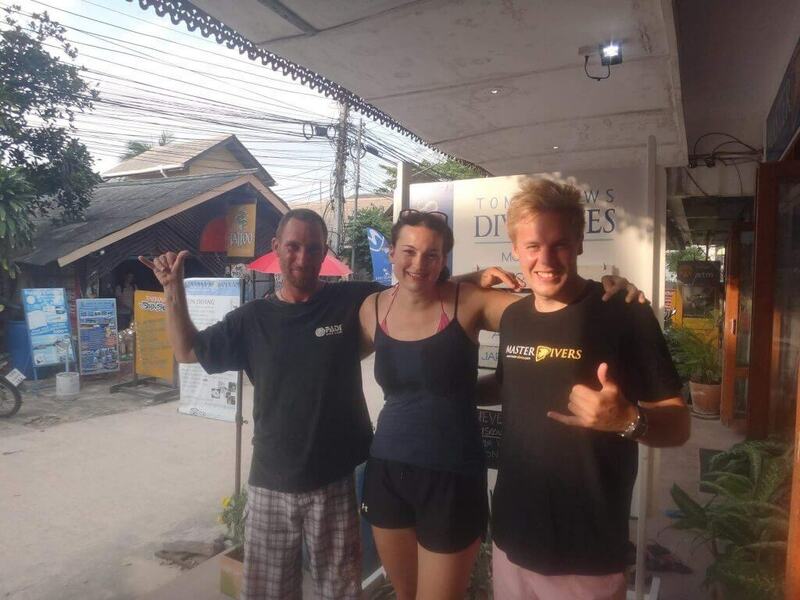 After a few days of online research I found the dive shop called Master Divers in Koh Tao. I had already heard good things about them through facebook and friends, so imagine how pleased I was to see they were offering the Self Reliant Course. The price of the course was also really good, 7000 Thai Baht, roughly 180 euro / 210 usd. 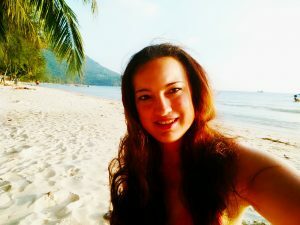 Koh Tao is a divers paradise. 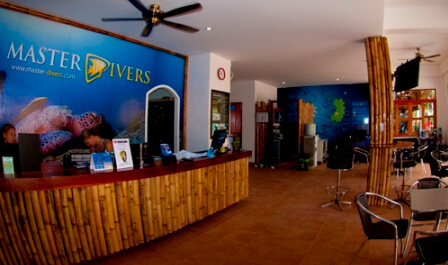 Without exaggeration , there are over 50 dive shops at least, which is crazy! Quite a few of these dive shops are huge, which creates a bit of a ‘ student factory’ feeling. I absolutely didn’t want to end up in a place like that. So far I’ve been very lucky that I nearly have had 1 on 1 education for every PADI course I’ve done, and that’s exactly the way I like it. In terms of size, I’d scale Master Divers somewhere in the middle. They’re not the biggest, but they’ve a nice steady amount of divers and courses every day. When it comes to my personality, I like to plan everything out. So whilst I was still in The Netherlands I e-mailed Master Divers to discuss everything about the course. Naturally I had many questions and they all got answered by the owner of Master Divers, Linzi, and her team. When a dive shop takes the time to properly answer every question you have it really feels they value their customers, and that’s exactly what I am after. Well who isn’t? My first two dives with Master Divers were two fun dives, necessary to show that your skilled enough in diving to go ahead and take the Self Reliant course. I was fortunate enough to have John (Chicken) as my instructor and another instructor Ben also joined the course to become a Self Reliant Instructor. Two instructors just for me, result!! 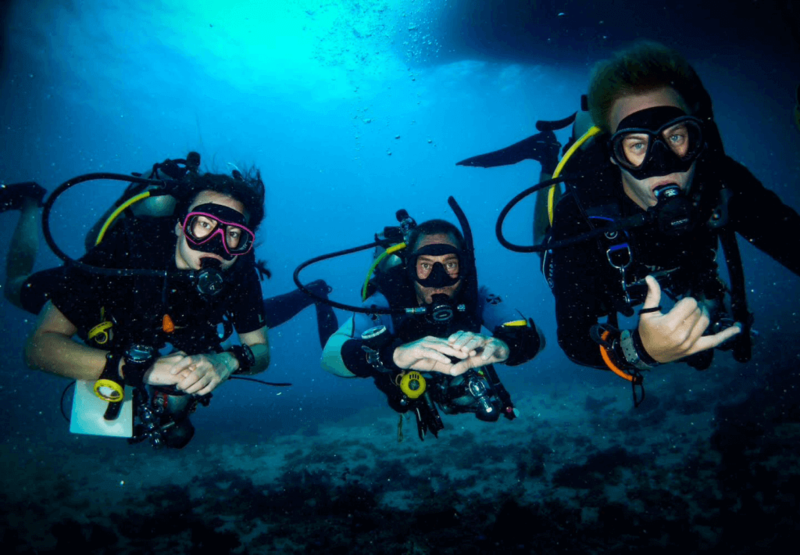 The Self Reliant course consist out of 3 dives and a theoretical part. On day one we started off the morning with the theoretical part, which was really interesting. Even though I’m already a certified Divemaster, I learned quite a few new things during the theory morning. I honestly think this course is a great way to expand your dive knowledge for any recreational diver, but especially for the professionals amongst us!! The theoretical part was also really pleasant because everything got explained so well and clear. Nothing was rushed and I felt really comfortable asking anything that was on my mind. John had all the answers to my questions which really made me very confident diving with him. Next up was the diving! On day one we were going to do the first two dives. In both of these dives I had demonstrate certain skills and monitor/calculate my SAC (Surface Air Consumption) etc. All necessary to set up a good dive plan. It was really a lot of fun doing this as it didn’t only give me more confidence that I was able to do what was asked of me, but I also learned some things about my own diving… like how much air I use in general per minute etc. Also I got to experience what it is like diving with all this extra dive equipment. Initially I thought I was going to feel like a decorated christmas tree with all this extra equipment you’ve to take with you. But John and Ben helped to streamline it all and not once during the dive was I annoyed with all the extra equipment, not even the extra tank of air!! On day two of the diving I was actually going to be diving on my own, as in I had to plan the dive and ‘guide’ John and Ben. On the boat both John and Ben gave me great detailed information on the dive site so I could make our dive plan and explore the dive site. This dive was amazing!!! Everything went really well, including the navigation between the different pinnacles. We ascended exactly where we descended, couldn’t have gone any better. What a confidence boost! It also really demonstrated how important it is to be well informed about the divesite before diving, it just makes the dive so much more fun and relax knowing exactly where you are and being in control. After this dive I had completed the course! I am now officially a certified Self Reliant Diver, and it feels great!!! Also btw, being on the Master Divers boat is really relax. I like how absolutely nothing is rushed with Master Divers. We took our time for everything, setting up equipment etc. Especially when trying something new it’s so important to feel completely at ease, so you can focus on what’s important. So many dive shops do not understand how important this ‘chill atmosphere’ is. Between the dives, during the surface interval, fruit was served on board as well as tea, coffee, water etc. Really properly organised by Master Divers! The boat headed back to the Master Divers diveshop where we logged the dives in my logbook and sorted out the certification! For Ben this was also a nice moment as our last dive was the last dive he needed for this Instructor Self Reliant Diver certification. Happy faces all around! The next day, after getting certified, I directly went for some solo diving!! I mean come on, not every dive shop accepts Self Reliant Diver certifications yet and actually lets you dive solo… which is a whole other discussion topic for some other day. But fortunately Master Divers does recognize it and let’s you dive solo, as long as you make sure to have a dive plan ready and bring all the necessary equipment. I.e. 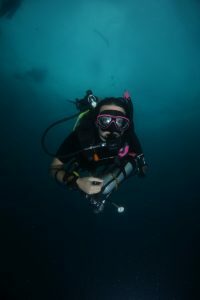 prepare exactly the way you are supposed to when solo diving. Again on the boat the instructors and divemasters happily told me everything about the dive sites that there was to know. It gives such a great kick being able to navigate natural and with compass on your own and just succesfully ascending where you descended. Okay truth be told, on the second dive site White Rock I ascended 1 buoy too far… but really…. this was still a win in my book as I was told everyone get’s lost at White Rock. What matters is that you ascent safely (surfacemarker buoy etc.). For me solo diving really adds extra fun and challenge to diving. Navigating on your own, everything on your own pace, just yourself and the fishies. It’s so zen. I love it.